Fire is an important factor affecting forests , changing the species composition and the forest climax, destroying the trees and altering the nature of the soil . Trees species have different reaction towards fire . Thick bark and deep rooted trees are less affected by fire than thin bark or shallow rooted species. Fire is started in anumber of ways mostly by human action ,natural causes of fire are few ,mainly lightening for which no incidents were observed ,the other may be heat rays by silica crystals on theedge of grass blades or bottle bottoms thrown away among thick grass .silica crystals and bottle bottoms are thought to be the cause of the grass fires in remote localities where no human settlement exists. Fires are generally started by cultivators preparing the land for crops , by graziers burning the dry grass to encourage fresh grass to flus and to destroy thicks , by hunters and by honey collectors to generate smoke to drive away the bees . Fires are also caused by negligence when travelers leave behind bwring camp fires or passengers throwing cigarette ends . Fire is the most important factor effecting forests , grass fire sweeps through the savanna belt both low and high rain fall every dry season , the low rain fall savanna is the legistimate product of repeated annual burning with it is fire resistant species , the most obvious damage caused by fire in the direct destruction of trees which are burnt to ashes resulting in the loss of timber . 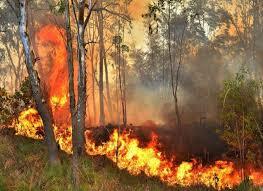 Fires convert the natural stands from broad leaf timber trees to thorny acacias and finally in to bush and grass land .